The classical/jazz fusion trendsetting Turtle Island Quartet celebrates the music of Jimi Hendrix Friday, Oct. 14 at 8 p.m. in the Lawrence Memorial Chapel. 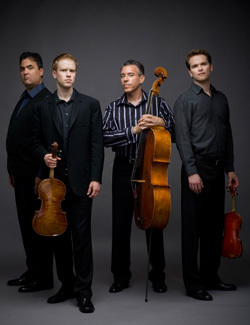 The quartet opens Lawrence University’s 2011-12 Artist Series with their dynamic “Have You Ever Been…?” program. Through their exploration of jazz, classical and world music styles, the Turtle Island Quartet has taken audiences on journeys through many musical genres, eras and places, including the American landscape, Latin America, Europe and India. Released in 2010, “Have You Ever Been …?” was the brainchild of violinist Balakrishnan, who credits the inspiration for the disc to a pair of Hendrix concerts he attended as a teenager at the Los Angeles Forum in 1969 and ’70. Shortly thereafter, he began playing Hendrix tunes on his violin. At his creative peak in the late 1960s, Hendrix redefined the potential of the guitar as well as the entire rock genre, creating a blueprint that still is challenging guitarists in particular and musicians of all stripes more than four decades later. 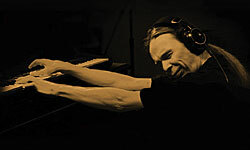 Led by Balakrishnan, TIQ, which includes co-founder cellist Mark Summer, violinist Mads Tolling and newcomer violist Jeremy Kittel, has taken Hendrix’s cue in the course of its 25-year history by reexamining and reconstructing conventional genres of music and seeking new permutations of style, technique and composition. That mission was exemplified in its Grammy-winning 2007 recording “A Love Supreme: The Legacy of John Coltrane,” in which the quartet reinterpreted the music of one of jazz’s most pivotal figures by injecting it with their own signature rhythmic innovations and multicultural influences.